“The Token Rose”, a plea for tolerance. The Token Rose flutters in the cold. Copyrighted, 2014-2018, because intolerance and hatred doesn’t have a specific date. Token was a woman in an in law’s family who turned lesbian to the shock and dismay of her family, etc. She blew her brains out while talking to these folk on the phone. This was decades ago, but the horror of ‘Christian’ intolerance still shocks. Fundamentalism leads to death within any religion. These people want to be called ‘early Christian’ but to me and many others, they are shock troops of Evil. Regardless Token’s sexuality, she deserved better. When will our intolerance and ignorance abate? Apparently never. And….I transplanted this 20 year old rose bush to the new rose garden in the back last fall, as it was ailing. Today I saw huge rose buds and such wonderful, green foliage. Token lives on and I am grateful. She will always live for me in this rose bush. “A Kapitany, Chapter 29 with a WARNING. I have had a lot of fun writing this book. I am very appreciative of the readers and their contacting me with all sorts of suggestions for the progress and plot of this book. That makes it a lot more fun for me. New eyes, fresh vision, etc. I have also decided to leave in the sexual content of this chapter. You are all adults or you probably wouldn’t be reading this blog. Paris never changes, thought Vadas. It was an old shoe, comfortable, familiar. He maintained an apartment, more a loft on the Ile Saint Louis. It was expensive, but he was right in the middle of Paris. It was a place where he could disappear, think, gather himself. Not many knew of it and that was what he wanted. It was a place where he could bring a woman, to finalize plans, to relax. Rarely had he brought other men there, and certainly no clients. While he told people he was going to Budapest, he went to Paris. It was a short flight. He hadn’t been here in a while and needed to think. He couldn’t do this around Elizabeth. She was too much a distraction. Plus she would whine if she knew why he was in Paris. He had a phone call one night. Miklos was seen in Paris. Whether he was still here or not, Vadas would find out. What he did next had to be planned very carefully. Noele lived on the Ile Saint Louis. He had known her for years. Sometimes she appeared like clockwork when Vadas was there. Other times, she didn’t, but if Vadas waited, Noele appeared. She was a prostitute but one Vadas found interesting. Or had. Now? He was too distracted to make good on what Noele was so energetically attempting to do. Vadas handed her double her usual charge and she left. He looked around the loft. It was very modern, with just a large bed in the loft up the steel staircase. A small kitchen, most of the ground floor was furnished with a leather couch and some club chairs. It was comfortable, without frills, stripped down. industrial fans whirled overhead and pipes were exposed. He leased this loft a decade ago, had done nothing with it and always found it restful. Now he wondered whether he could keep it. He wouldn’t need this place if he was working the vines in Noszvaj. He probably wouldn’t be able to afford it. He shouldn’t bring Elizabeth here. She would ask too many questions, and he would have to lie too much. Vadas thought of the years with Miklos. They had both grown rich with this work. Now that it had come to the end, Vadas knew he would have to scramble to make up the difference. The vineyard would have to prove itself each year. He would have to search out new clients for the wine. The restoration on the house would have to wait. He was a fool to think he could move Elizabeth in there after their wedding. Better continue to live in the lodge where at least there was electricity. He would remove the boar head from the dining room. The wolf head would stay where it was. He knew why Miklos took his revenge on Elizabeth. It was meant for him. Elizabeth had just been handy. He leaving had upset the apple cart. For years they had a clear division of labor: Miklos acquired the merchandise, and Vadas moved it. The insurance concerns were those of the original owners. It had worked smoothly for twenty years. They picked up their fee when the insurance paid out. Now? With him pulling out, Miklos had no where to put these works. Miklos had been the brains on one end, and Vadas on the other. Miklos couldn’t be sure that these works would disappear and wouldn’t be traced. In over twenty years, Vadas had come to know the tastes and expectations of their clients. He would present these works to new owners who weren’t particular of legalities and provenance. Of course, they never dealt in well known artists or pieces: those were impossible to unload, except for a few collectors who would pay a lot of money to lock up a Picasso in a home vault. They were the eccentrics. They were also dangerous. They had enough wealth to roll over on anyone who appeared suspicious to the police. No, their business was different. If an owner had need of money, a burglary could be done and later, an insurance claim made. Once the work was well hidden, the list of clients could be trolled and a new owner found. Again, this owner would not care about ownership, provenance or the attending legalities. He had previously obtained part of his collections this way. Of course, the work in question could not be seen for a matter of years, until interest and knowledge of the piece had died down. No, it could not be shown to knowledgeable guests at a dinner or cocktail party. But so many of these collectors would want something they had to lock up: to be seen by them only. It was a rush to them. They had deceived the police, investigators and the insurance men. That was thrilling to many and played heavily into the game. Sometimes, Vadas thought, the artwork was just a vehicle for this rush. No different than drugs. Now Miami was the international center to fence stolen art. With the wealth there and the drugs, these precious paintings were traded for guns, drugs or used for ransom. This was too dangerous for Vadas and probably for Miklos. However, this situation would give Miklos an outlet if he so desired. That’s if he lived long enough. Miklos and Vadas had worked like clockwork. Both knew their roles and both excelled at them. Now with Vadas pulling out, the whole business would crash around Miklos’ feet. No wonder he was in a rage. He would have to train someone to take Vadas’ place. That would not be easy. At one point, Vadas considered turning state’s evidence. Too many of his own men would fall with him. Even if Miklos fell harder, Vadas was thinking of the others. This was no way to repay the loyalty of a group of men who had, over the years, taken the big risks. Some had become friends. The next day he met with a man on the Left Bank. This man had been paid to watch all the usual places that Miklos was seen when in Paris. Vadas couldn’t track him because Miklos or his men would immediately recognize him, but informants would work well here. So far, Miklos had been seen only once. He hadn’t checked into his usual hotel, and wasn’t seen in his usual haunts. But he was here for some purpose. Vadas had another reason to come to Paris. His dead mother’s lawyers held property for him. He knew it would be wise to collect that property now before he dealt with Miklos. He needed to get as much of it back to Hungary where he could secure it. Who knew what the future would bring. The morning of his appointment, he left the loft and strolled over the Pont Marie. 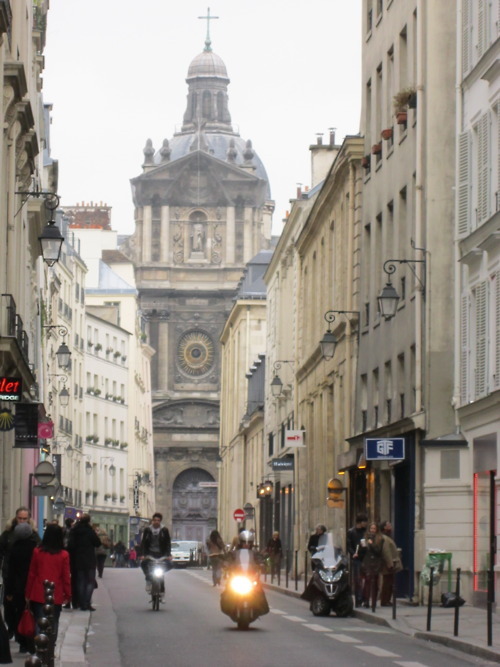 He headed down to the Rue des Francs-Bourgeois in the Marais district. There were boutiques lining each side of this long street and a lot of pedestrians. It was a beautiful morning, with sunlight touching the buildings and giving them a soft gleam. There were old women, flower vendors, with bouquets in buckets near the park and at entrances of old buildings. Bookshops, restaurants, and the smell of coffee and flowers filled the air. Vadas stopped for a coffee and sat outside at a table. There was nothing more colorful, more interesting than watching Parisians walk about. The women were sleek, like greyhounds, and dressed with flare. Perhaps it was the same in Budapest, but here, in the Marais district, it was more exotic to his eyes. Parisian style was a world to itself. Paris in this early summer was as Paris should be: the center of the world and as romantic a place as one could desire. He would bring Elizabeth to Paris, perhaps on a honeymoon. He was old fashioned enough to want one and to dazzle her with the surroundings. Perhaps they would spend a couple of weeks here just getting to know each other. Perhaps he could keep her in bed for a week and get to know every inch of her. Elizabeth had never been in France. This would be the place to start. The countryside could wait, but he knew she would want to experience that, too. He wanted to see her reaction to a city he deeply loved. He knew she would not be disappointed. He looked at his watch. It was almost time for his appointment. Entering the 19th century building of the law firm, Vadas wondered about the property. He knew some land was involved, perhaps land heavily timbered. He knew his mother’s jewels were part of this wealth he had come to Paris to collect. Since Miklos had taken the bracelet he gave Elizabeth, he wanted to replace it with something. What, he had no idea as he had not seen the jewelry. It had been placed with these lawyers many years ago, when she died. He was shown into the interior office of one of the firm’s lawyers. He remembered Monsieur Depardieu from his last visit. That had been at least ten years ago. Monsieur Depardieu was small and sleek, much like the women outside the window. He hadn’t changed much in the years. More grey hair on his head, but he looked much the same. Shaking hands, Vadas sat down across the large desk. An assistant appeared and returned with a locked wooden box. There was a folder of papers on the desk in front of Monsieur Depardieu. Vadas thought he had rather neglected the two old darlings, but said he was on his way to Budapest to visit them. He would remember Monsieur to them. After discussion about the deeds, which turned out mostly to be of hectares of timberland, Monsieur Depardieu opened the locked box and turned it to Vadas. There were necklaces pinned on black velvet, bracelets and some pins. A few rings, but not what Vadas wanted for Elizabeth. He wanted a wedding ring, or something with a diamond. There were a few that had possibilities but none struck him as right. Some of them were just fussy, out of fashion. The necklaces were something to be worn on special occasions, not daily fare. Perhaps he would have to look for a ring either here or in Budapest. He finished with Monsieur Depardieu and arranged for the box to be shipped to his Budapest bank. It would be safer for the lawyers to arrange their delivery from Paris to Budapest, than for him to make the effort. When he was in Budapest, perhaps he could look again at the pieces. Perhaps something would stand out for her wedding present. As for the deeds, they did expand his vineyards, and though he would have to chop down a lot of trees, he could sell the timber and then plant more vines when the land was cleared. It would take a lot of labor. The vineyard needed to be expanded if he was going to plant more varieties. And he needed to do this if he was going to make his living honestly. The money with Miklos was over. He would live a different life. It would be a shift in priorities. That evening Vadas lit a cigar. He rarely had a chance to enjoy one as Elizabeth didn’t like the smell. She would learn to live with it after they married, he thought with a chuckle. He wondered whether he should call but decided not to. Soffia was there for a purpose and let her entertain Elizabeth. He wondered what Soffia was doing on that front. Probably they were spending his money in Eger. That was inevitable. Vadas blew smoke towards the ceiling. He watched the slow moving fan above. Those two were as different as two women could be. Soffia took from life without a second thought. She would be a bad influence on Elizabeth if they ran around too long. Elizabeth was impressionable. Vadas laughed to himself. He told Soffia to obey “Rule Number One” in his absence. He knew before he was out the door she wouldn’t. He slouched down in the chair. It had been a long day, and finally he was relaxing. He had done a lot of walking, more than he usually did. His feet were tired. Walking the streets of Paris were harder than climbing the hills of the vineyard. What did it really matter if Soffia seduced Elizabeth? Again. What a lesbian did to another woman was nothing but girls playing around. Innocent enough. Let Soffia stick her nose in Elizabeth. It would not matter a mite when he got home. He knew his sexual power over Elizabeth would erase any such nonsense. Ah, Elizabeth. There were endearing things about that girl. She would come from the bath and use some sweet smelling oil on her skin. She would shake powder over her, rub it in. He would act like he wasn’t watching, wasn’t interested in her toilette, but he was. He was interested in all she did in these things. He watched her shave her legs (with his razor), even caught her douching. She went from extreme modesty to tolerating his presence as she prepared herself for bed. One day he went over to where she had her bath supplies and picked up the powder. Baby powder. Ah, when she came to bed, he wanted to eat her up. She smelled so clean and fresh, just like a baby. He loved to dig his face into her flesh and smell these enchanting female scents. He loved the softness of her, each fold revealing itself like a flower petal. He would push his tongue deep into her and bury his face, holding her tightly by the hips. He loved how she made these little mouse squeaks when aroused. She could scream her head off when coming. It always made him smile when she yelled. This was how a man possessed a woman. Satisfy her to her toes and she would show her devotion. She would wind herself around him like a cat. Vadas’ thoughts did what Noele couldn’t. He was stiff with no woman around. Ah well, he would just have to finish up his business here, go to Budapest and see the old aunties. Then he would go home and plow Elizabeth. Perhaps Soffia would warm her up for him. He pulled a folded handkerchief from his pocket. It was sprinkled with baby powder. Vadas sniffed deeply.